Enter a new world of mark-making possibilities by learning how to etch the surface of lino with a caustic solution. As well as introducing printmakers to this exciting – and sometimes unpredictable – technique, Steve Edwards will share the techniques he uses to register the multiple plates used to create his dramatic large-scale landscapes. An exciting new exhibition opportunity for ELP and its members. East London Printmakers invites its members to participate in a public exhibition of work; consisting of original books and prints; coinciding with the launch of ELP’s Maker Library as an addition to the British Council’s growing Maker Library Network, a project established to connect artists, designers and makers around the world, enabling the sharing of knowledge and skills, and encouraging collaboration. The exhibition will include: handmade books and zines in a range of formats and print mediums; copies of original prints from which these books are made, showing the processes used; simple bookbinding and finishing demonstrations from members, highlighting facilities and resources available in the studio; and a showcase of artists’ books alongside our newly constructed ELP Maker Library. In addition to hosting an evening promoting ELP and its members, we will be encouraging those taking part to donate copies of their books, instigating a new ELP Maker Library Archive of works and projects. Artists’ submissions added to this archive will form the foundation from which we will build a collection of artworks and resources for sharing and promotion, in addition to documenting ELP’s involvement with the Maker Library Network. We are asking our members to: make simple handmade books created using print processes available at ELP; using one, or more, of five provided templates, including: poster, trouser, stitched, and cross fold poster books. These books can be made from new or existing work and the templates are designed so that each book can be produced from a single piece of A3 paper, printed on one or both sides. This exhibition is open to all ELP members, so join us to take part and start planning your books! Delivery to East London Printmakers,19 Warburton Road, E8 3RT, by Friday 18th March. Please submit your books in an envelope marked with your full name, title and contact details, and address to ELP Maker Library. 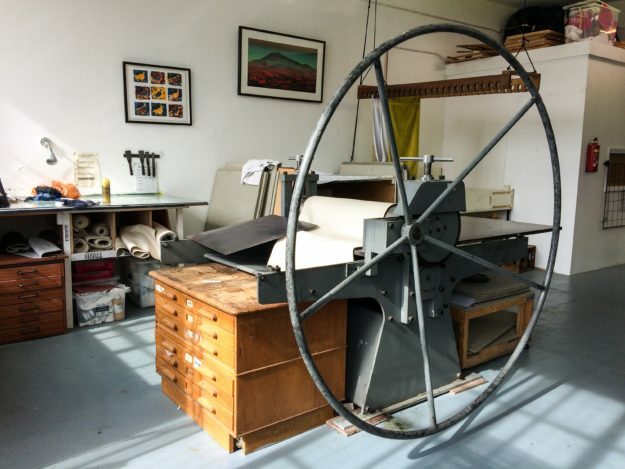 Friday April 1st, 6pm – 9pm, East London Printmakers, 19 Warburton Road, E8 3RT. If you are a member please email [email protected] to register your interest, and keep a lookout in your inbox, social media, and our website for further information. If not, follow this link to become a member for only £30 per year and start making the most of the benefits of being an East London Printmakers member. Visit the Maker Library Network website for more information on this project, or please feel free to get in touch or chat to our Maker Library team to find out more about the project and how to get involved.